8th September – Gyuto, Dharamsala. cuted writers,Liao Yiwu, had an audience with His Holiness Karmapa this morning at Gyuto Monastery. 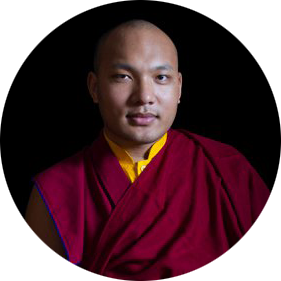 ” The current situation of His Holiness Karmapa and the fact of continuous self immolations of the Tibetan people has brought me here to visit His Holiness Karmapa” said the musician Liao Yiwu, he played xiao, an ancient flutelike instrument during the audience, the flutelike instrument that sustained him as a street musician during long bouts of joblessness after his release. In 1990, he was jailed as “counterrevolutionaries.”He spent four years in jail after publishing a poem titled Massacre about the Tiananmen Square crackdown. Liao Yiwu, the outspoken Chinese dissident and writer, has won a top German literary prize recently. The German book publishers’ association named Liao as the winner of its annual Peace Prize. Previous winners of the $31,700 award, to be handed over during the Frankfurt Book Fair in October, include Orhan Pamuk and Mario Vargas Llosa. Liao has been living in Germany since 2011. ” I am very confident that he is the new hope for Tibet ” said Mr. Liao Yiwu after meeting the Gyalwang Karmapa.ublished in Taiwan in 2001.